Your wine may be bottled but your style doesn't have to be. Let it run free! 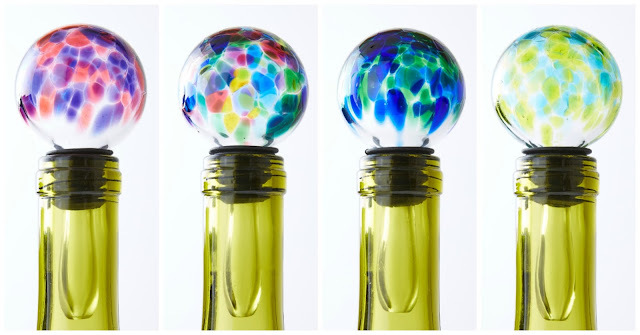 Turn any wine bottle into a work of art with our recycled glass bottle stoppers. Need more incentive? These luminous lovelies are handmade right here in the USA. Tucked in the town of Pawtucket, Rhode Island, our designer heats clear glass to 2,000 degrees, then rolls it in bits of crushed, colored glass before forming the kaleidocopic globe. Blending beauty and craftsmanship, form and function, these jewel-like toppers make it easy to halt your happy hour. Wine not open that second bottle when you can preserve it in style?